Joey Bosa: A Family Tradition? 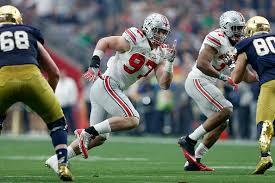 DE-Joey Bosa, Ohio State 6′ 5″ 269 lbs. Cons: The athletic defender does not have many pass rushing techniques, instead he relies more on his brute strength with limited spins and swim moves. Bosa needs to get creative with dips, rips, and better hand usage to slip past blockers on the way to whomever has the ball. The defensive end sometimes shows heavy feet that take time to get a jump off the initial snap. This causes Bosa to guess the count too often, which results in a lot of offside penalties for him. He gets caught leaning forward too much, when the defender gets off-balance, he ends up on the ground too often for my liking. The former Buckeye doesn’t always play with intensity and lacks the commitment to deliver the full blunt force behind his pads that is necessary. Pros: Bosa finds the ball quickly while flowing down the line of scrimmage stacking and sliding showing great football intelligence. He uses his arms well to keep blockers off his body, knocking them back with a strong punch, sheds them quickly, and can anchor the edge when needed. The former Buckeye can attack the pocket using seven, five, or three techniques, but seems to cause more pressure than sacks the further inside he rushes. This defensive end is strong and flexible enough to make a tackle while being blocked by simply reaching out and grabbing a runner with one arm. Bosa can play either the left or right side and has worked on his ability to force fumbles. On rare occasions, the former Buckeye can also drop back into pass coverage. He showed off his explosiveness at the NFL Combine with a 120″ broad jump, a 6.89 second three cone, and a 4.21 second 20 yard shuttle. Comparing him to classmate running back Kenneth Dixon (either the third or fourth best at his position depending who you talk to), Bosa bested his three cone and 20 yard shuttle times and lost by an inch to Dixon’s broad jump. That is an athletic defender! Overall Impressions: I think Bosa is a good NFL prospect, but I have my doubts if he will ever become a great player aka leading the league in sacks or tackles at his position. Brute power and strength only take you so far and he will need to improve on his technique to be a true NFL difference maker. I have higher hopes in that regard for a certain defensive tackle/end from Clemson, DeForest Buckner, to make a huge NFL and fantasy impact. You can follow me on Twitter @AndrewMiley and/or the site @Dynasty_Blitz.